Over the last year, I have focused on becoming a connected leader and learner. Through Twitter (@kfilane), Facebook (Holy Angels School), Instagram (@hasrocks), and blogging I have been building up my online presence, have been connecting with others, and have been developing relationships that are crucial in education. Through my own learning journey, I have been modelling, and have been sharing and connecting with others – serving as a way to develop my Principal Qualification Practicum, and to develop my digital learning network. Putting my thinking and wonderings out there for anyone to read was both exciting and humbling – would others care what I thought? would they see how much I didn’t know and how much I still need to learn? would they care what I was thinking? would my thoughts resonate with anyone? In my journey to be connected, I have developed an amazing network of colleagues, sources of inspiration, and models of learning that have taken my own learning and have exponentially helped me grow in ways I never would have thought possible. Through that “missed opportunity” I learned more, and was set on a path of learning and connecting that I never knew was possible, and here I sit today, reflecting on my PQP journey of leadership and preparing to hand in my Practicum. Through my connected world, I have learned about the power of innovation (creating things that are new and better), I have limited the isolation that I once felt (“Isolation is a choice that we now make” @gcouros), and I hope that I have modelled for others the power of connecting, and taking risks in your learning. Today, I participated in a wonderful learning opportunity organized by our own Katie DiBiagio (SNCDSB), and Stacey Wallwin (SGDSB), our regional Technology Enabled Learning Teachers (TELTs) who facilitated George Couros spending the day with System Leaders, Principals, and Digital Learning Teachers from both Boards. The topic was Leading Innovative Change, and it was like the cherry on top of my PQP Practicum sundae – as a system, we were connecting and hearing the message all together! Today, George inspired us all with his innovative mindset and his focus on relationships and connecting (first to the heart, before we can connect to the mind). I was able to share this day with people who have inspired me, influenced me and learned with me in this journey. As a leader and a learner, I think it is vital that we build connections not only within our Board, our school and our communities, but also throughout the world, where we now have access to many others who are so willing and eager to share their learning. As this is the future for our students, if we don’t connect and learn how to be innovative together by building a digital learning network, we will soon become illiterate in the world that our students are living in. In these folders in our drive, they are shared with those people who can collaborate with and use the resources and ideas shared to make things easier. With Google Drive, you can access it on any device (computer, tablet, phone) so you always have access to your files and work. We recently started a Math AQ course in our Board, so I created a shared folder for all learners and put in the initial information (modules, evaluations, resources) that might make it easier for others, and invited everyone to use it and add to it. Instead of doing the work just for myself, I put it out there for others to access because I know that I appreciate it when others do it for me. We don’t need to start from scratch every time we do something – through collaboration and sharing together, we become much stronger then doing it all on our own. I love collaborating, and I know that I learn best from modelling, examples and other people’s sharing. Google Drive is a wonderful tool to use, and it’s features are straight forward and user friendly. Students in our Board are also active Google Drive collaborators since we were fortunate to host not one, but two Student Summits featuring Google over the last 2 years. Students know how to use these tools and they are using them to engage in peer editing, conferencing and collaboration as we learn together. In April 2016, we will have 40+educators from SNCDSB attend the TBCDSB Google Summit to continue our learning together – it is empowering to know that not only have we bought into GAFE, but we are also being supported in our learning together and our vision for the future includes empowering both students and educators to learn together, collaborate together and take risks in our learning as models for others – it is very promising and exciting knowing we are doing it together! How have GAFE tools changed practices? In what ways have you benefited from collaborating with others using Google Drive? A few years ago, our Board (Superior North Catholic) became a Google Apps for Education Board (GAFE). We started using Google Drive and Docs, and our Technology-Enabled Learning and Teaching Contact, Katie DiBiagio, had the vision that we should host the first ever Student Summit featuring Google. SNCDSB became the first Board to host students, rather then teachers, to learn all about Google Apps and then become the teachers for others. In November, 2015, after purchasing Chrome Books for all our students from Grade 5-8, we hosted a second Student Summit for all our Gr. 5/6 students in the Board, thinking that we would empower our Junior Students to become the learners and leaders in using Google Apps. Now our students regularly use Google Docs, Slides, Drawings and Forms – it’s amazing to see what they can do. Students share documents with each other, as well as their teachers, and we can collaborate together. In our PQP course, we used Google Docs to work together both during our face-to-face sessions, as well as our distance ed learning. It is a valuable tool in working together, asking for feedback and sharing resources. How has collaborating with Google Docs changed your practices? What benefits do you see in GAFE? 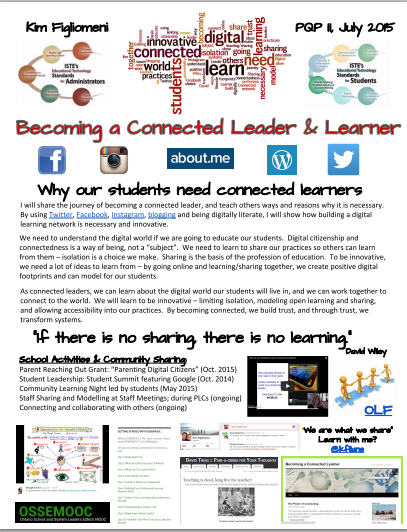 Collaborating online has become something that has become very important to my learning. Since I made the commitment to become a connected learner, I have interacted with so many amazing people – people who I would have never have had the opportunity to learn with had I not gone online. Being a huge fan of George Couros and his blog, The Principal of Change, I ordered his book, The Innovator’s Mindset as soon as it was available. After reading the book, and loving the questions that George posed, I was very excited when a group of educators organized an online book club to dig more into the innovator’s mindset. By collaborating online (using twitter #innovatorsmindset & @OSSEMOOC) and following along on the google hangout, I have been able to share my thoughts and learn from many others. Through this online group and collaboration, I was introduced to Voxer, an app that I had downloaded but didn’t quite understand how to use. Once I joined the Voxer group for Innovator’s Mindset, I entered into an online collaboration among some very amazing and passionate educators. Although I didn’t feel like I had a lot to contribute yet, I have been listening and reflecting on many different aspects of education and innovative thinking. Collaborating online is a tool that can connect you to people in your building, as well as people around the world, who are willing to share, challenge and work together for the benefit of us all. How has collaborating online influenced you? What opportunities have you taken part in? Have you ever wanted to share and access beautiful images? Flickr, an image sharing site is an option. You can save your own photos to Flickr (once you sign on and create a Yahoo account), and you can keep them private, share them with family and friends or you can make them public. You can also access photos shared by others, and use them through the Commons – the OSSEMOOC Day 17 post does a good job of explaining this. This quote seems to sum up things quite nicely for me lately. I seem to be falling a lot, and I never seem to have enough time in the day for all that I need to do. Lately, I find myself apologizing for being behind in emails, for not getting back to people, for not getting to my kids before they fall asleep … I seem to be falling, but in falling you need to get back up – and each day is a chance to rise again. What I’ve learned from my own experiences, and from some very wise and connected educators (thanks @fryed) is that being an educator isn’t easy, but it’s also an opportunity to be a learner, and to connect in ways that were not possible just a short time ago. In this connected world, there are so many people willing to share and connect and learn with that it absolutely amazes me. If you are all caught up, check out the OSSEMOOC Day 16 and learn how RSS Feeds can help you keep up with your favourite blogs and websites. If you need a refresher and want to learn about being connected, take a look back through some of the topics we’ve covered over the past few months (it was only meant to be a short break at Christmas, but when you fall, get back up and rise again 🙂 and pick one or two areas to connect with – start small – but make sure you just start! Day 11: What do we need from our PLN? Over the last year, I have been learning how to connect, why it’s important to connect and how connecting can push your learning farther and faster then you realized it could. I have developed relationships online, in person and with people I would never have found had I not made the effort to connect. Although I still have so much to learn, I feel value in my journey, and I if I can inspire you, then I have done my job at being a learner, a leader and a connected educator! As a leader and a learner, I have come to realize that I learn best with and from others. In completing my Principal Qualifications (PQP), the area that I have chosen to focus my Practicum on is “Being a Connected Leader and Learner”. I have come to value the educators who so willingly share what they think, know and wonder, and from this sharing, I have learned the importance of giving back. In November, we started with OSSEMOOC’s 30 Days to Getting Connected. After 15 days of connecting, we took a break (it was Christmas and it was becoming a chore rather then a learning experience). I would like to finish Day 16-30 and I hope that you are on up for the challenge. Join up, follow along, share your learning with us and with others. Add your email address to the right and you will receive notifications when a new post is made – it’s that simple! I know we are all busy, but let’s take time to connect! Exploring the Canadian Underworld through the earthworm community.